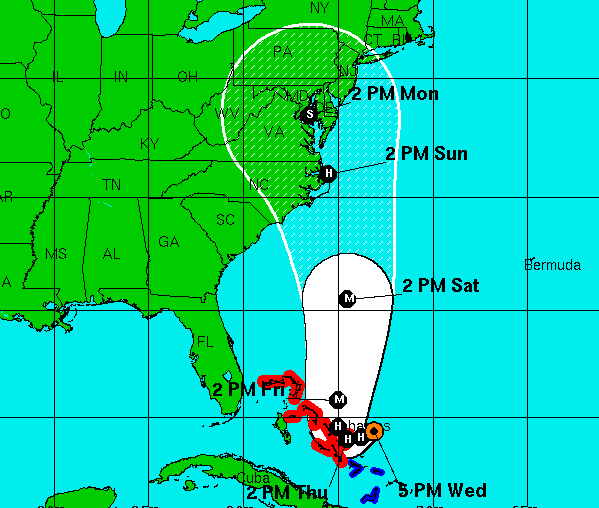 Home Island Life Latest Forecast Shifts Hurricane Joaquin Track South of N.J.
Latest Forecast Shifts Hurricane Joaquin Track South of N.J. The latest forecast tracking from the National Hurricane Center shows Hurricane Joaquin making landfall south of New Jersey, near the northern border of North Carolina, Virginia Beach and Chesapeake Bay, then continuing on a slow north-westerly track. The “cone of uncertainty,” as it has come to be known, has widened, and still includes New Jersey or even a potential track out to sea, though the official forecast track has shifted southwest compared to a forecast early Wednesday that indicated it would directly impact New Jersey. The storm was packing 115 m.p.h. winds by early Thursday morning. In order to gather more data to feed to forecast modeling computers, the hurricane said a jet has been sent toward the storm to deploy weather balloons. A hurricane watch for a portion of the U.S. coast could be required as early as Thursday evening, the hurricane center said. Barrier island communities across New Jersey began preparing for the storm Wednesday. A marine forecast indicated seas of 18 to 23 feet offshore this weekend, a testament to the storm’s potential strength.